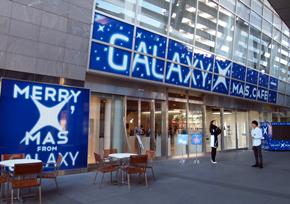 “GALAXY X’MAS CAFE” which the Samsung electron opens by the December 5 to 25 limited time offer. By the thing that it is touched by the system and the related goods of Android terminal “GALAXY” series. Business hours are 11:00 to 23:00 (a GALAXY touch & try corner is 12:00 to 22:00). Entrance is no charge. The eating-and-drinking cost of a coffee shop starts independently. 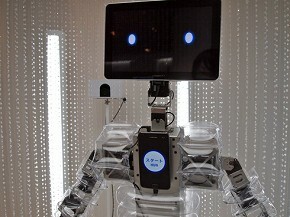 If you follow an exhibition corner to the back, there will be various GALAXY series-oriented accessories and the Android robot “my HUG” which will run by GALAXY if it goes previously will meet further. My HUG is a robot which runs by GALAXY, GALAXY Tab 10.1 LTE achieves a face and GALAXY S II LTE has played the role of CPU.Operation of specification, such as hugging with both hands, if the start button currently displayed on GALAXY S II LTE is pushed, is carried out (function etc. which are hugged while calling their name, if it registers). Besides a hug, the words which were danced according to the song or were registered in advance are said. Via: IT Media.